Richard L. Armitage was born on 26th April, 1945. Armitage graduated from the United States Naval Academy in 1967. He joined the United States Navy and served on a destroyer stationed in Vietnam during the Vietnam War. This eventually resulted in him becoming an advisor to the Vietnamese naval forces. In 1973 joined the office of the U.S. Defense Attaché in Saigon. Here he became involved with Ted Shackley, the CIA chief in South Vietnam. According to Joel Bainerman (The Crimes of a President) Shackley and his Secret Team (Thomas G. Clines, Carl E. Jenkins, David Morales, Raphael Quintero, Felix Rodriguez and Edwin Wilson) became involved in the drug trade while serving in Laos. They did this via General Vang Pao, the leader of the anti-communist forces in Laos. Vang Pao was a major figure in the opium trade. To help him Shackley used his CIA officials and assets to sabotage the competitors. Eventually Vang Pao had a monopoly over the heroin trade in Laos. Shackley and Clines also helped Vang Pao to obtain financial backing to form his own airline, Zieng Khouang Air Transport Company, to transport opium and heroin between Long Tieng and Vientiane. Ted Shackley also brought others into his drug operation. This included Armitage and Major General Richard Secord. According to Daniel Sheehan: “From late 1973 until April of 1975, Theodore Shackley, Thomas Clines and Richard Armitage disbursed, from the secret, Laotian-based, Vang Pao opium fund, vastly more money than was required to finance even the highly intensified Phoenix Project in Vietnam. The money in excess of that used in Vietnam was secretly smuggled out of Vietnam in large suitcases, by Richard Secord and Thomas Clines and carried into Australia, where it was deposited in a secret, personal bank account (privately accessible to Theodore Shackley, Thomas Clines and Richard Secord). During this same period of time between 1973 and 1975, Theodore Shackley and Thomas Clines caused thousands of tons of US weapons, ammunition, and explosives to be secretly taken from Vietnam and stored at a secret "cache" hidden inside Thailand." This money, with the help of Raphael Quintero, found its way into the Nugan Hand Bank in Sydney. The bank was founded by Michael Hand, a CIA operative in Laos and Frank Nugan an Australian businessman. As a result of State Department internal investigation, Armitage was forced to resign his post. He moved to Bangkok where he ran the Far East Trading Company. According to Leslie Cockburn (Out of Control), Armitage "carried on funneling drug money out of the Southeast Asia and into Nugan-Hand and elsewhere." In 1978 he became an aide to Bob Dole. Two years later he became foreign policy advisor to President Ronald Reagan. In 1981 he was appointed as Deputy Assistant Secretary of Defense for East Asia and Pacific Affairs in the Pentagon. In this post Armitage played a leading role in Middle East Security Policies. On 17th March, 1983, Donald P. Gregg had a secret meeting with Felix Rodriguez and George H. W. Bush in the White House. As a result the National Security Council established a secret scheme to provide aid to the Contras in Nicaragua. Rodriguez agreed to run the Contra supply depot in El Salvador. In a memo written to Robert McFarlane, Gregg argued that the plan grew out of the experience of running "anti-Vietcong operations in Vietnam from 1970-1972". Gregg added that "Felix Rodriguez, who wrote the attached plan, both worked for me in Vietnam and carried out the actual operations outlined above." On 21st December, 1984, Gregg met with Felix Rodriguez and George H. W. Bush. This led to Gregg introducing Rodriguez to Oliver North. Later, Bush wrote a note to North where he thanked him for "your dedication and tireless work with the hostage thing and with Central America." In October, 1985, Congress agreed to vote 27 million dollars in non-lethal aid for the Contras in Nicaragua. However, members of the Ronald Reagan administration, including George Bush, decided to use this money to provide weapons to the Contras and the Mujahideen in Afghanistan. Eugene Hasenfus, an Air America veteran, survived the crash and told his captors that he thought the CIA was behind the operation. He also provided information that several Cuban-Americans running the operation in El Salvador. This resulted in journalists being able to identify Rafael Quintero, Luis Posada and Felix Rodriguez as the Cuban-Americans mentioned by Hasenfus. In an article in the Washington Post (11th October, 1986), the newspaper reported that George Bush and Donald P. Gregg were linked to Felix Rodriguez. It gradually emerged that Armitage, William Casey, Thomas G. Clines, Oliver North, Edwin Wilson and Richard Secord were also involved in this conspiracy to provide arms to the Contras. In November, 1986, Ronald Reagan set-up a three man commission (President's Special Review Board). The three men were John Tower, Brent Scowcroft and Edmund Muskie. Armitage was interviewed by the committee. He admitted that he had arranged a series of meetings between Menachem Meron, the director general of Israel's Ministry of Defence, with Oliver North and Richard Secord. However, he denied that he discussed the replenishment of Israeli TOW missiles with Meron. The report implicated Oliver North, John Poindexter, Casper Weinberger and several others but did not mention the role played by George H. W. Bush. It also claimed that Ronald Reagan had no knowledge of what had been going on. The House Select Committee to Investigate Covert Arms Transactions with Iran was also established by Congress. The most important figure on the committee was the senior Republican member, Richard Cheney. As a result George H. W. Bush was totally exonerated when the report was published on 18th November, 1987. 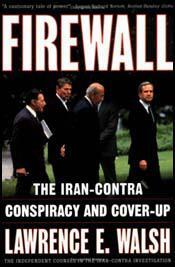 The report did state that Reagan's administration exhibited "secrecy, deception and disdain for the law." When George H. W. Bush became president he set about rewarding those who had helped him in the cover-up of the Iran-Contra Scandal. Bush appointed Armitage as a negotiator and mediator in the Middle East. Donald Gregg was appointed as his ambassador to South Korea. Brent Scowcroft became his chief national security adviser and John Tower became Secretary of Defence. When the Senate refused to confirm Tower, Bush gave the job to Richard Cheney. Casper Weinberger, Robert McFarlane, Duane R. Clarridge, Clair E. George, Elliott Abrams and Alan D. Fiers, Jr. were pardoned by Bush. In 1991 Armitage became special emissary to King Hussein of Jordan. In 1992 George H. W. Bush sent Armitage to Europe where he directed U.S. foreign aid to the states that had been formed out of the old Soviet Union. Armitage lost office when George H. W. Bush was defeated by Bill Clinton. He returned to the private sector but remained involved in politics. In 1998 Armitage was one of those who signed The Project for the New American Century that was sent to President Clinton in 1998. The letter urged Clinton to target the removal of Saddam Hussein from Iraq before he created weapons of mass destruction. The main intention of the letter was to protect Israel from Arab countries in the Middle East. During the 2000 U.S. Presidential election campaign Armitage served as a foreign policy advisor to George W. Bush. After his victory, Bush appointed Armitage as his Deputy Secretary of State. He left office on 22nd February, 2005 when he was replaced by Robert Zoellick. The Government's trial evidence would have demonstrated that, contrary to the impression created by his false testimony before Congress, Weinberger was a knowing participant in the initiative to send arms to Iran in return for the release of Americans held hostage in Lebanon. In the summer of 1985, Weinberger knew of President Reagan's decision to authorize Israel to send missiles to Iran and his commitment to replenish Israel's missile stocks. Beginning in late September 1985 and continuing through the end of 1986, Weinberger also received a sizeable quantity of highly classified intelligence reports regarding the Iran initiative. These intelligence reports provided detailed information regarding the pricing and delivery of missiles sold to Iran and the release of American hostages in Lebanon. In particular, in very late November and early December 1985, the reports revealed that HAWK missiles were shipped to Iran from Israel in connection with hostage-recovery efforts. In his testimony before congressional committees, Weinberger falsely claimed that he had been cut off "to a large extent'' from this intelligence until shortly before December 7, 1985, when he first received one of these reports. The Government's evidence also would have shown that Weinberger deliberately concealed from Iran/contra investigators his diary and meeting notes, which would have demonstrated the falsity of his testimony. For simplicity of discussing the evidence supporting the individual counts, this Report begins with the evidence proving the falsity of Weinberger's denial of the existence of his notes, which was charged in the original Count One and Count Five. Because Count One was dismissed, this discussion begins with Count Five. If Armitage reviewed North's paper on or about December 5-6, 1985, this would establish the falsity of Armitage's statements that he was unaware until November 1986 of Israel's 1985 arms shipments to Iran and the U.S. commitment to replenish Israel's stocks. If the North paper was used by Armitage as a basis of briefing Weinberger for the December 7, 1985, White House meeting this would have been powerful evidence that Weinberger's professed lack of early knowledge of the 1985 Israeli shipments was false. There is no question that Armitage and Weinberger received North's December 5, 1985, paper at some point. Armitage placed a copy of the paper in Weinberger's briefing book before the November 10, 1986, meeting of President Reagan and his senior advisers to discuss the Iran arms sales.OIC obtained no testimonial evidence as to who delivered the North paper to Armitage or when it was delivered, but circumstantial evidence indicates that Armitage received North's paper on December 5 or 6, 1985. During the November 10, 1986, meeting, Weinberger made extensive notes on the backs of the pages of North's December 1985 paper. After the meeting, the briefing book apparently was returned to ISA, "broken down'' and refiled. Although Armitage obviously returned this document to the files, it was not produced to Congress or Independent Counsel in 1987. The OIC first located the copy of North's paper with Weinberger's notes when it reviewed a segregated collection of Iran/contra material at ISA in 1992. Armitage's logs show that North placed a telephone call to Armitage's office at 6:50 p.m. on December 5, 1985, but they apparently did not speak. The next morning, North called again and spoke to Armitage at 8:30 a.m. North arrived at Armitage's office at 9:00 a.m., and he called and spoke to Armitage by telephone at 10:05 a.m. Although no witness explained this series of contacts, the sequence of events suggests that North called Armitage to tell him of the paper, then dropped off a copy at Armitage's office, and then called back an hour later to get Armitage's views after he had read the document. - because Weinberger and Powell were in Europe until the night of December 6, 1985, Armitage was the senior DoD official at the Pentagon who was familiar with the Iran arms sales; he was the logical person to be informed of the North paper. By his own description, Armitage was the person who was gathering information as part of the effort to prepare Weinberger for the December 7, 1985, White House meeting.